Cucumber,amla , ginger piece with cleaned coriander curry & mint leaves. 1. White pumpkin piece around 200gms. 6 .small piece of ginger. 7.You can also add one carrot in small pieces. 1. Remove the skin of pumpkin.Also remove the seeds.Remove also sponge like portion in the pumpkin. cut it into small pieces as shown. 2.cut the amla fruit into small pieces. 3.cut the cucumber into small pieces. 4.Cut the ginger into small pieces. 5.Clean the coriander,curry & mint leaves with water. Put above things in a mixie jar. Add required quantity of salt & 50 ml of water. 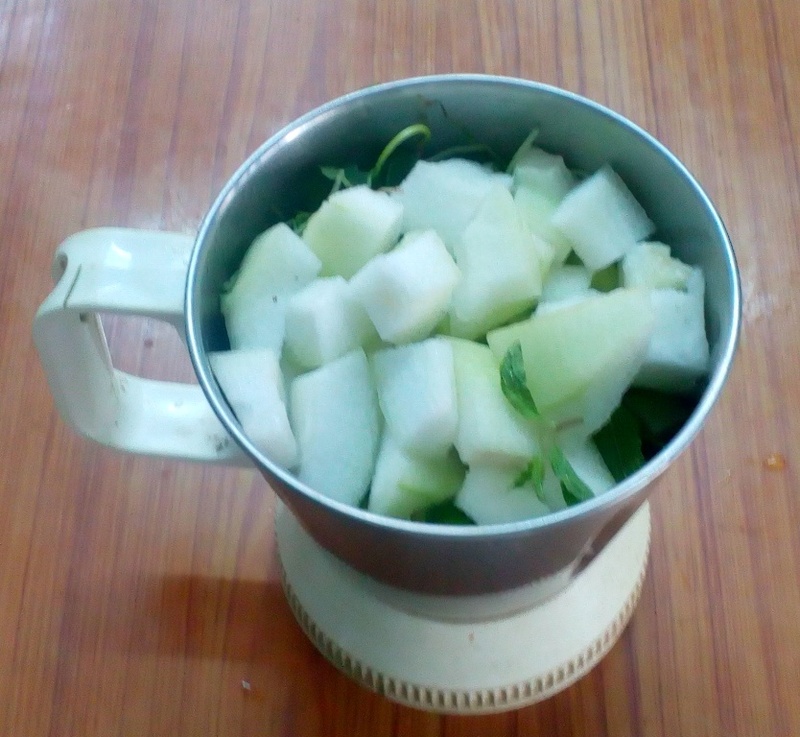 Grind it well for few minutes, filter it & the juice is ready for 2 persons ( 2 cups); Add a pinch of pepper powder & serve. You can take this in empty stomach in the morning. You can also take this one hour after taking tea or coffee. Better take this in between morning & before noon. .For children above 5 years 50 ml is sufficient. 1.White pumpkin dissolves kidney stones if taken taken regularly. 2.As this juice has more water content this would cool your thirst. 3.Ginger, coriander,mint & curry leaves would combine well to give you good appetite. All this would cost you only few rupees. 4.Just 15 mts enough to prepare & serve this. Try this & give us your feedback. Take this juice once or twice a week. As for as possible use fresh pumpkin piece.Don't use the pumpkin after storing more than 2 days in the fridge. Use the pumpkin one hour after if stored in the fridge.